MANHATTAN — More than 30 public elementary schools — including TriBeCa’s top-ranked P.S. 234 and the Upper East Side’s P.S. 59 — are set to participate in protests Friday to blast the state’s standardized English exams. The planned protests by schools in Manhattan's District 2 — which also includes Greenwich Village and Chelsea — are part of a growing anti-testing movement in some of the city's most esteemed public schools. 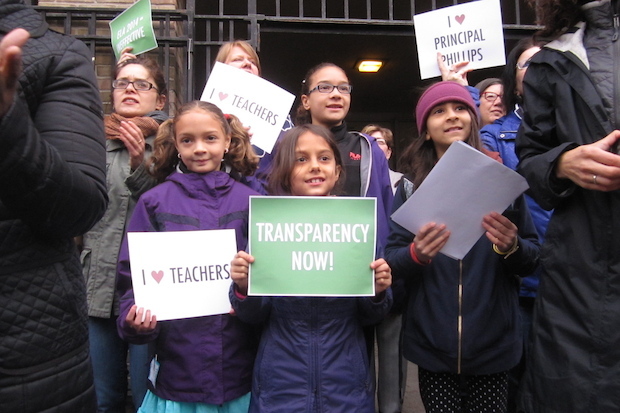 Last week, a protest at Park Slope's P.S. 321 drew hundreds of teachers, parents and students who complained about age-inappropriate content and poorly explained multiple-choice questions that seemed to have no one right answer. Now, the 31 Manhattan elementary schools are planning an even bigger demonstration at each of their schools Friday morning, to demand that the exams be released to the public as soon as they have been graded. “Given the terribly high stakes of these tests, for schools, for teachers and for kids, and the enormous amount of human, intellectual and financial resources that have been devoted to them, test makers should be prepared to stand by them and to allow them to undergo close scrutiny,” P.S. 234 Principal Lisa Ripperger and P.S. 59 Principal Adele Schroeter wrote in a letter co-signed by other principals in their district. The principals who signed the letter said they were "disappointed" by this year's English exams, which they felt did not fairly test what their students had learned. “[Many of us] stood by helplessly while kids struggled to determine best answers, distorting much of what we'd taught them about effective reading skills and strategies and forgoing deep comprehension for something quite different,” the principals wrote. Teachers, principals and other school staff are not allowed to speak publicly about the specifics of the exams, for fear of losing their jobs, because test creator Pearson often includes questions that don't count but could be used by the company in future exams, educators said. The New York State Education Department, not Pearson, established the gag order policy to keep the test confidential, a spokeswoman from the testing company said. The Education Department did not immediately respond for comment. The standardized tests were overhauled last year to be aligned to the new, more rigorous Common Core standards. In turn, scores dropped precipitously, with only 26 percent of the city’s third- through fifth-graders passing the reading test, and only 31 percent passing the math exam (which will be given at the end of April this year). Marlowe Bamberger, co-president of the PTA at Murray Hill's P.S. 116, told DNAinfo that she planned to add her voice to Friday's protests, explaining that the tests were "putting unnecessary stress on our children and teachers" and taking away valuable class time to prepare kids for exams that "are impossible to prep for." "I am not at all against testing," Bamberger said. "But these tests are out to trick our kids. And for what purpose?"